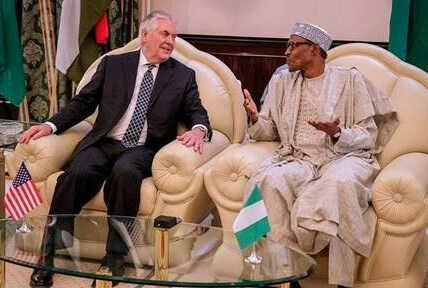 An extended visit to Africa this month by the U.S. Secretary of State to mend fences after the President’s crude description of African and Caribbean countries was cut short this week by the dismissal of the embattled Secretary Rex Tillerson. It was the first tour of the continent by the ex-Secretary who was the first high level U.S. representative to visit the continent since the President’s vulgar remarks. Tillerson has been replaced by the CIA director, Mike Pompeo. The President — who has long clashed with Tillerson— claimed it was important to make the change now, as he prepares for talks with North Korean leader Kim Jong Un, as well as upcoming trade negotiations, three White House officials said. Quietly, however, Chadian President Idriss Déby made his anger known about his country being targeted in a Muslim travel ban despite close working relations between the two countries on anti-terrorism. Other planned activities that were called off included the laying of a wreath at the memorial to victims of the 1998 U.S. embassy bombings in Nairobi and Dar es Salaam, and a working luncheon with Kenyan leaders. 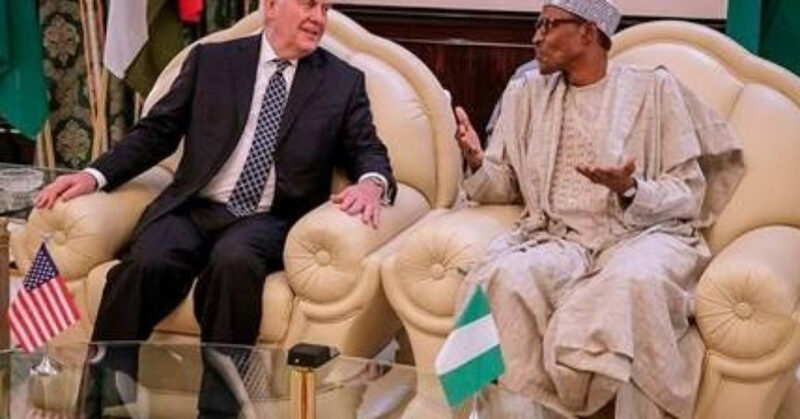 A full day of meetings in Nigeria was reduced to a quick chat with President Muhammadu Buhari and his foreign minister before hopping a flight home. Among the responses to the State Department’s visit was a published piece by visiting professor of international relations at South Africa’s University of the Witwatersrand, Joseph J. Stremlau, titled Three Reasons why Africa should treat the visit with scepticism. The Secretary was scheduled to visit just five of Africa’s 54 countries: Chad, Djibouti, Ethiopia, Kenya and Nigeria – the so-called “arc of instability,” noted Stremlau..
Stremlau’s second reason for skepticism is that the US hasn’t shown much appetite for diplomatic engagement with Africa since Trump became president. “Neither Trump or Tillerson has announced an overarching Africa policy. No assistant secretary for Africa has been named, important embassies, including in South Africa, lack ambassadors. This is in sharp contrast to the US’s active engagement on the military front,” he pointed out. Stremlau congratulated African leaders for setting a dignified precedent when Trump compared African countries to dirty toilets. Africans should also remind Tillerson of their appreciation of China’s increasing importance as their leading development partner, Stremlau urged. He added: “It’s worth recalling that since the 1990s, Congress has consistently supported expanding economic and political partnerships with Africa. “The reason for this is that congressmen have been pressed to do so by African-Americans as well as other sympathetic elements in America’s diverse civil society, business, and philanthropic sectors.